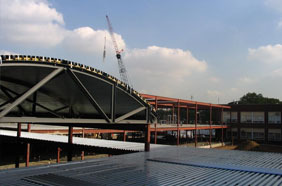 LAN’s Construction Administration Department guides our clients through the entire construction process. Our team performs constructability reviews, estimates and scheduling during pre-construction. Additionally, we assist clients needs in the bidding process by providing recommendations on contract award. During construction, we maintain the construction schedule, ensure quality control, track change orders, issue punch lists and assist clients in obtaining a Certificate of Occupancy (CO). The core principle behind our construction management team is to ensure that the building is built on time and to serve and progress contractor relationships and coordination.